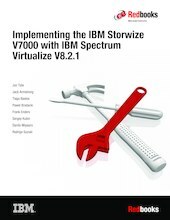 This IBM Redbooks® publication introduces the features and functions of the IBM Storwize V7000 and IBM Spectrum Virtualize™ V8.2.1 system through several examples. This book is aimed at pre-sales and post-sales technical support and marketing and storage administrators. It helps you understand the architecture of the Storwize V7000, how to implement it, and how to take advantage of its industry-leading functions and features.